Q. How do I access Course and Teacher Ratings? 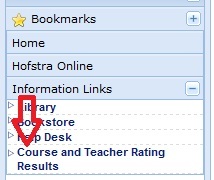 The Course and Teacher Ratings Results are now available through the my.hofstra.edu portal. Once you log in, look at the Bookmarks menu on the left-hand side. Open the Information Links sub-menu by clicking on the button on the right. You will see the link for the Course and Teacher Ratings Results. A full description of the content and directions on how to access the ratings are provided.